From Microsoft we see that there is a lot of work going on. The main area behind the offices appears to be a large construction site. 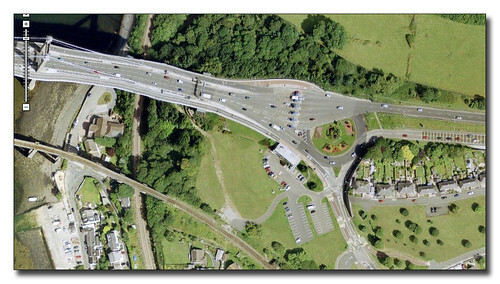 Its actually in use by contractors working on the bridge widening scheme. 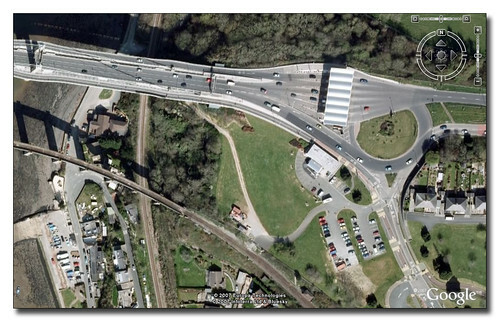 By the time we reach our next image from Google Maps we see that the widening work has been completed. The image is a lot clearer in Google Maps than Virtual Earth! The construction has cleared and the site returned to a car park and nice clear grass area. You can clearly see the new lines of the bridge road deck - and very elegant it looks too. 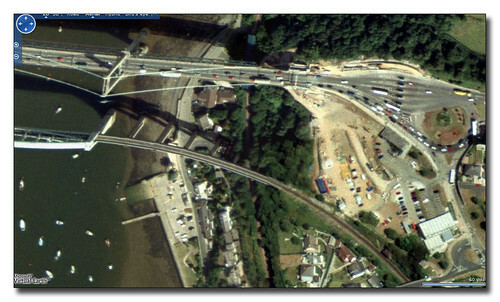 The final most up to date image from Google Earth shows one big change. The new structure over the toll booth area has been completed and shows up very nicely in the new image. You can see that some road resurfacing has taken place too. I have also noticed that the roundabout seems to have lost some of its feature plant beds too!